OnePlus 7 is not far away from getting announced because it has been a while since the company launched its last flagship phone One Plus 6T. A new video released by a YouTube user named Waqar Khan shows the concept rendering of One Plus 7 based on the speculations and rumours. They really look stunning and there is a high possibility that this concept will get as close to the real finished product. 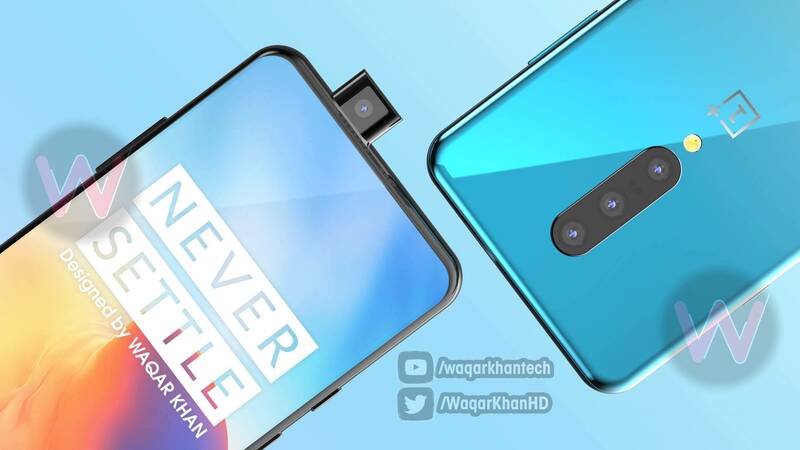 The video shows the device with a all-screen display and there is no sight of the water-drop camera notch. Instead, the phone will have the selfie camera pop out from the upper portion similar to what we hav. e seen in OPPO and Vivo phones. Also based on all the rumours, the phone will come with a triple lens camera where an extra lens will take care of the photography requirements perfectly. OnePlus phones are well know for their advanced camera and tweaking it to make room for improvements will definitely go down well with the users. Also coupled with a Snapdragon 855 processor, the phone is bound to ruffle feathers of its competitors. Instead of placing the front-facing camera in a notch or in a whole that’s cut out of the screen like the Galaxy S10, this design places the lens in a small piece that pops out of the top edge of the phone when you need it. The front-facing camera then retracts and remains out of sight when it’s not in use, and this type of design allows manufacturers to almost completely eliminate the bezel at the top of the screen.